Forza Head Case 1964 Ferrari Cylinder Head Combustion Chamber Restoration. This is a photo of a Forza Head Case 1964 Ferrari Cylinder Head. The arrows in this Forza Head Case Photo point to the 45 degree valve seat. These seats have been cut too far into the copper alloy valve seat inserts. The term used to describe this is, “the seats are sunk”. 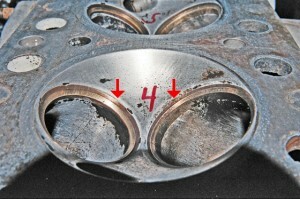 Any valve job removes material from the valve seat inserts. As the 45 degree valve seat is cut it becomes wider and lower in the cylinder head. A valve seat that is too wide requires a top cut. 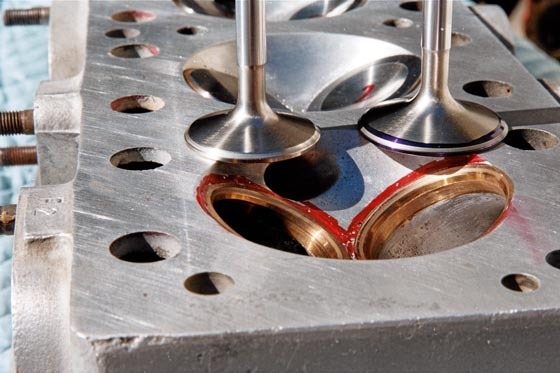 Most Valve Seat Inserts need Replacement when the top cut has to remove material from the combustion chamber. This photo shows the Forza Head Case 1964 Ferrari Cylinder Head with a Restored Combustion Chamber. We have done a Complete the Valve Job.We are using new Custom made Stainless Steel Valves. We installed new custom made Copper Alloy seat inserts and new Bronze Alloy Valve Guides. All the Combustion Chambers have been welded and machined to original specs. All New Valve Seat Inserts are installed at the Original Height. Note seat widths and locations on both valves and seat inserts. To see this procedure in detail please click here.